Recently, we had the honour of meeting up with Datin Maureen Ooi, the CEO of the Madam Kwan restaurants; the daughter in law of the legendary Madam Kwan and a member of YPO, who truly inspires the young business people in Malaysia to say the least. She gave us some insight stories on how Madam Kwan came about and what makes them stand strong till today. What started as Sakura Café by a former beautician in the 70s at Jalan Telawi 3, has now become a home-brand to us Malaysians. Currently there are 8 outlets of Madam Kwan’s in Malaysia itself and they have recently expanded into Vivocity, Singapore as well. Asking about how they managed to maintain the tradition whilst being so successful in the F&B industry, without thinking twice, Datin said that they stand by the motto of Madam Kwan herself, “my food is my life”. She mentioned that it is their meticulous attention for detail in making sure every single ingredient used in the process of cooking till the presentation of the dish itself is of high quality; maintaining every step of the processes whist preserving the same values they have had since 70s. Even the single rose they put on the table is a tradition that is maintained from the 1970’s Sakura Café, which is to remind them of their humble beginning. They take great care in ensuring only superior quality ingredients are sourced and always conserved how a dish is served, since day one. From weighing every chicken thighs individually, to the choosing the cucumber for garnishing; everything needs to be precise and up to par. Most of the ingredients used in Madam Kwan’s are sourced locally and freshly, making sure every item is of great quality. In terms of competition, Datin said that she welcomes it as it is healthy, needed and inspiring. She explained that if the menu one puts out is unique and the dishes are classic and deep-rooted, one can become successful in this industry and slowly become part of the Malaysian culture. She told us that the three most popular dishes in Madam Kwan’s is the Nasi Lemak, Nasi Bojari and Char Kway Teow which makes up 33% of their sales. Asking what her favourite dish is, she said, it was the Cantonese Style Fried Noodles and the ‘Petai Sambal’. 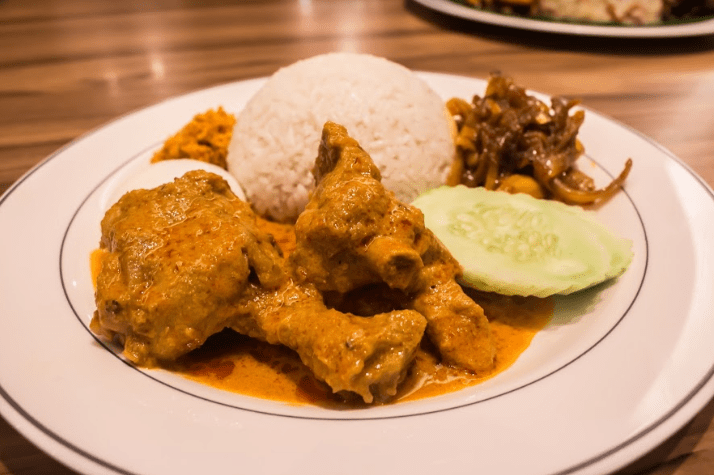 However, she would recommend the Nasi Lemak and Nasi Bojari for the first timers and the Curry Fish Head dish as well as the ‘Kangkung Belacan’ from their menu, to the adventurous foodies out there. Hearing this, us pandas got so hungry, that we can’t wait to try the food any longer! The first dish we tried was the Malaysian Satay (Chicken). Those succulent and hearty pieces of chicken that was marinated perfectly, charred perfectly and dipped into the sweet crunchy peanut sauce that was truly appetizing. 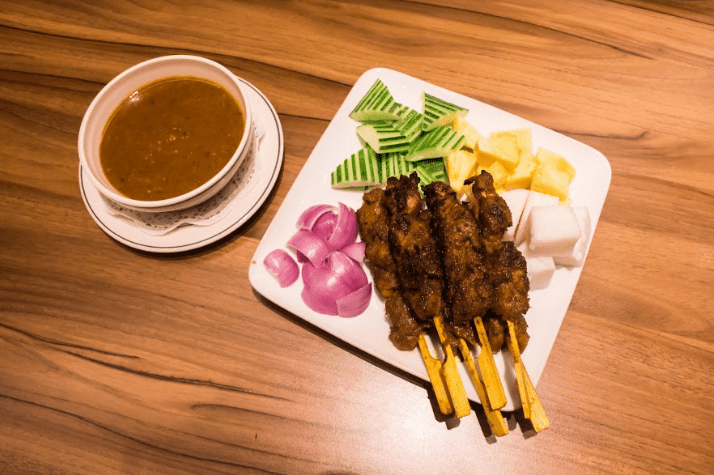 It was indeed one of the best satay we have tasted. Then we sampled the Nasi Bojari. 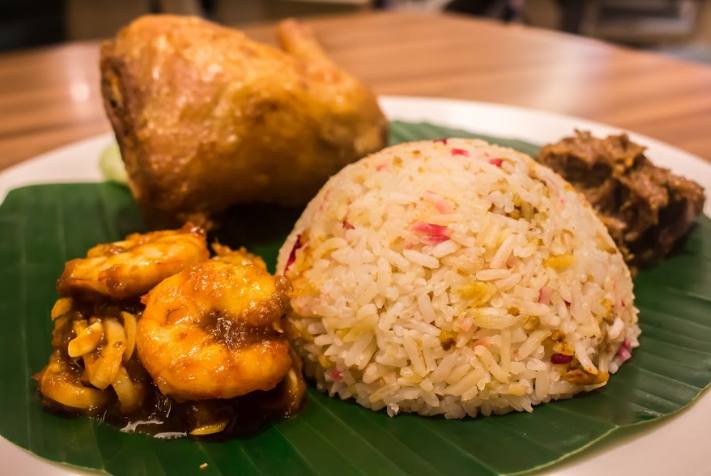 A dish that is made of tri- colored rice served with ‘assam’ prawns, beef ‘rendang’ and deep fried chicken drumstick. The drumstick was juicy, tender and meaty while the ‘assam’ prawns were sour with a touch of heat true to its name and the shrimps being plump and juicy tasting so fresh. The beef rendang was meaty and cooked to perfection in the savory ‘rendang’ sauce. All these went perfectly well with the colorful and buttery rice that tasted heavenly in each bite. We then tried the Char Kway Teow. This dish is made of flat rice noodles stir fried with chicken, prawns, eggs, squid, bean sprout and green onions. You read that right! No fried noodle could be as wholesome and as delicious as this one. 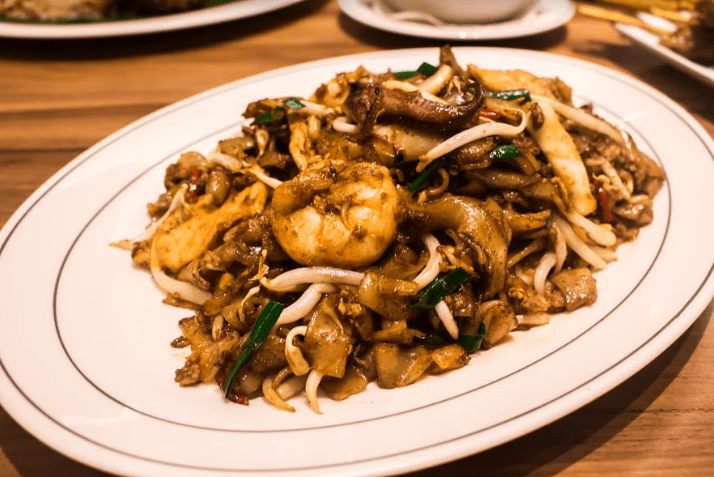 It had generous servings of huge juicy prawns, thick cuts of squids and crunchy bean sprouts that reminded this writer of the authentic ‘char kway teow’ you get in Penang and Perak. A delicious mouthwatering dish that is perfect for anyone. The next main, which this writer was very excited for is the Nasi Lemak. Not being your typical ‘nasi lemak’, this had the authentic home-fried kind of anchovies ‘sambal’, chicken curry with big chunks of meaty chickens, dried shrimp floss and some ‘acar’ which is a slightly spicy and tangy pickled vegetables with crushed peanuts. This is one dish that is truly signature to Madam Kwan themselves. The extraordinary ‘sambal’ that is tangy, sweet and spicy went so well with the creamy and coconutty rice. The chicken curry was wonderfully delicate and tender chicken pieces that is soaked in the flavor of the earthy curry just added the perfect “umph” for this Malaysian favorite. Just when we thought we are done for the day, they brought out the Cendol. 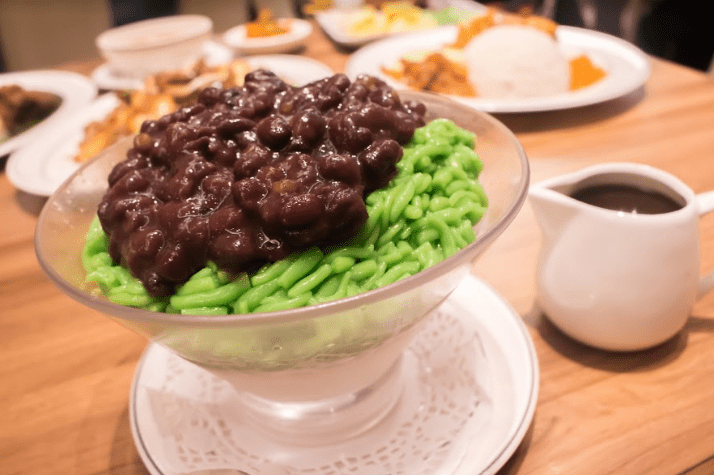 This luxurious looking dish is nothing but the green jelly strips with red bean on shaved ice sitting on coconut milk and topped with ‘gula melaka’. The best thing about the dish here is that the ‘gula melaka’ is given separately which allows their customer to choose how much of sugar they want with this dessert. The Cendol was refreshing and the sweet and creamy coconut milk, being one of the healthiest milk out there, tasted like a Beethoven symphony in our mouth. The perfect finish to a perfect meal. All in all, we did not only have our bellies filled with the most exquisite meal but our hearts too were filled with warmth and joy from the friendly customer service and delightful ambiance Madam Kwan provided us with. One thing is for sure; in every bite you take, you will taste the richness and wonderfulness of our Malaysian cuisine, thanks to Madam Kwan’s drive to only deliver the best. They captured the ultimate Malaysian flavors perfectly in each dish they make. Click here to order online from Madam Kwan’s. If not eating or cooking, watching beauty gurus talking about make up in YouTube is what this writer will be doing at any given time. Food for her, is an art; and boy oh boy is she an art lover or what?